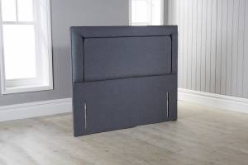 There are plenty of terms in the world of beds to confuse you, perhaps the most important lesson to learn is how to avoid mattresses with spring units which are totally useless. Cage sprung, continuous coil and open coil mattresses are the most basic, uncomfortable and unsuitable mattress support units available. Here we explain exactly why cage sprung mattresses are a complete waste of money. Unless your budget is £100-£150 or less you should never consider an open coil model during your selection. We would even argue that a solid slab of foam is more suitable in some instances than a continuous coil sprung mattress for the money. Cage sprung mattresses have been around for a long time as mattress manufacturing started to occur on an industrial level to meet demand. This is because they are relatively easy to make, incredibly cheap and require no real specialist skill, other than that of a machine to manufacture them. You can churn them out very quickly. There’s no need for hand side stitching or any kind of craftsmanship with this kind of support unit. What is a cage sprung mattress? Cage sprung, open coil, continuous coil and brand names such as ‘miracoil’ are all terms for the same thing. If it has ‘coil’ in the description you can be pretty sure it’s referring to a cage sprung mattress. They represent a support unit made of a continuous piece of wire that is coiled to create a massive set of joined crude springs. The design of which is incredibly rough and ready with one size for everyone approach. 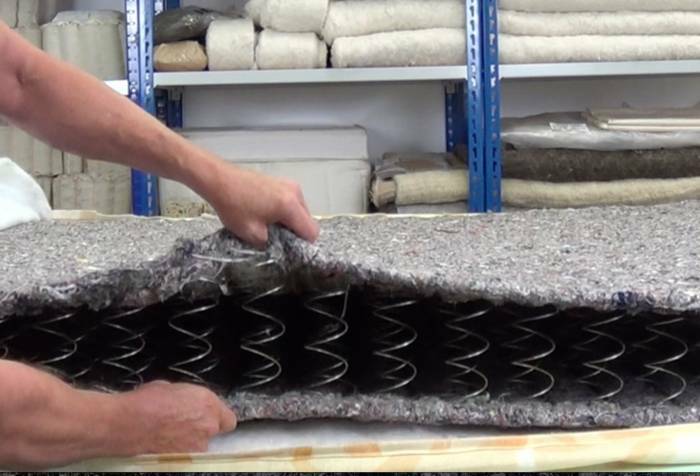 There are a few different methods of making coil sprung mattresses. They all start with the same idea of coiling wire but some use barrel shaped coils, others use hourglass shapes and then others just really wide circular coils. The best of a bad bunch will add perimeter support such as adding a flat steel frame around the outside of the mattress to attach them to. The cheapest and least desirable is where they just coil the springs together with no perimeter support as seen in the picture below. Meaning the edge collapses when you sit on it. You may recognise this description from beds you may have had in the past, especially in property rentals, caravans or discount hotel chains. It’s the kind of support unit that once you bounce on it, you continue to bounce, as does anyone else on the mattress until the energy has rippled through every inch of wire in the mattress! You can see in this entry level cage sprung mattress above that it is covered in cheap recycled fabric. Recycled fabric like this grey wadding is made up of shredded clothing, discarded fabrics, odds and sods. If you’re buying a quality mattress £350+ you should never accept this type of material. It’s not because this fabric is recycled that is the issue, far from it, it is because there is no separation of the fabrics used in this kind of wadding, everything from second-hand cardigans, offcuts of wool, bits of old sofa covering to polyester is used. This gives it a very firm, course and inconsistent feel. If this was recycled wool, cashmere or cotton, all graded and separated then it would be far better. Unfortunately, the world of mass manufacture doesn’t currently operate this policy. 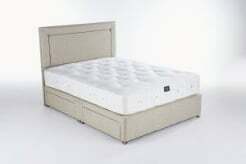 The mattress above is of the lowest quality seen by the wadding, however, there are open coil/continuous coil/cage sprung mattresses used even in supposedly quality mattresses! Why are open coil mattresses unsuitable? Simply put they will only accommodate the heaviest person and will give no consideration for different weighted sleepers. Given they are one mass-spring you will also find discrepancies with the support offered across the mattress. The middle of the mattress is likely to be far softer than the edges. 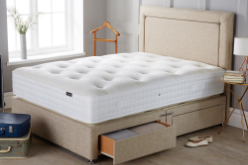 Settlement in the mattress is far faster than a quality pocket sprung mattress, as once part of the spring fails or compresses then the rest of the mattress will either follow suit or become misshapen. They are crude in their design and have a very short shelf life. They are often topped with basic components such as the grey wadding, but we’ve even seen cage sprung mattresses topped with quite generous layers of polyester which hide the issue with the support unit. So at first, it may feel comfortable but this feeling is only temporarily before you start to suffer from the inconsistent support unit. There is zero separation of the spring units so any movement transfers through the entire mattress. If you put a heavy weight on one side the other side will also sink and vice versa. With the availability of pocket springs, which are far superior to any cage sprung mattress, there is no need to settle for a cage sprung mattress. There simply isn’t a price argument left for cage sprung mattresses given that entry-level pocket sprung mattresses are available at a similar price point. Why do people buy cage sprung mattresses? So after all the negativity about cage sprung mattresses, you may ask what on earth would lead someone to knowingly buy one. They can be significantly softer in the middle than the edges. There are only two real answers to why people still buy cage sprung mattresses. Cage sprung mattresses are incredibly cheap, in theory, though its still sends shudders through us when people are paying £300 plus for a mattress that utilises cage springs. If you are spending £300+ you should have a look at our starter model, the Origins Comfort for the minimum standards you should accept at this price point. A cage sprung mattress, however, should be no more than £100-£150 to buy. As we detail all over the site, the majority of manufacturers and salesmen in bed showrooms have no real detailed knowledge about the components used. They base their sales pitches on marketing brochures which sell you the basic features irrespective of their quality. 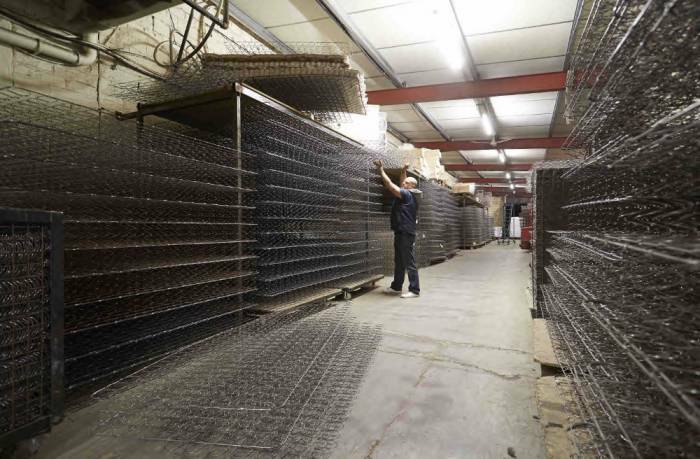 For example, a cage sprung mattresses become described as ‘continuous coils of support‘ or ‘fully sprung supportive sleep surfaces ‘, which even makes a cage sprung mattress sound desirable! Many consumers are simply confused and baffled by the myriad of descriptive words when looking for a mattress. After a while, they either give up or settle for whichever model met their budget, without ever being informed of what said mattress contains or its suitability for them. What are the alternatives to continuous coil mattresses? Pocket springs are superior in every way to the cage sprung mattress and our detailed article on them here should be read to fully understand them. Reduced transference of movement between the sleepers and offer a more isolated support meaning that only the parts of the mattress that have pressure on them are actually working. Whereas in the coil sprung the entire mattress gives and flexes when any weight is on it. Each pocket spring works independently giving a far more advanced support unit. Allowing various states of compression in each individual spring rather than the entire coil sprung unit sinking to the most pressured area. ie an elbow will depress the mattress more than say an ankle in a side sleeper, but the entire mattress has to compress to that lowest level of the elbow, whereas a pocket spring can accommodate both. Pocket springs come in a variety of tensions and can even be used side by side for split tension mattresses. This is impossible in an open coil mattress. John Ryan By Design never has, nor never will use a cage sprung, open coil or continuous coil support unit. We only use made in the UK steel spunbond encased pocket springs in our Origins range and in our higher-end Artisan range only use Vanadium coated Calico encased pocket springs. We often get asked about orthopedic mattresses, especially for bad backs which we have a detailed post on here. Orthopedic mattresses are synonymous with bad backs, back aches and chiropractors advising you need firm support. We have debunked this advice and recently the BCA British Chiropractors Association has followed suit advising against super firm mattresses. An orthopedic mattress is any spring unit which uses a 1.94mm 12 gauge spring. This is an incredibly firm and hard spring, which is how you get that uber firm feel. A number of orthopedic mattresses are actually caged sprung mattresses. This may shock you given the price of orthopedic mattresses, but cage sprung construction methods allow for a super firm spring unit. Whereas pocket springs are more forgiving than the cage sprung, the 1.94mm 12 gauge spring takes no prisoners! This really isn’t a benefit though it means you’re stuck with a very inflexible mattress. Earlier in the post, we discussed how they are crude in their construction and because this wire is so thick when it is used in one continuous piece it makes for a really firm spring. We would argue that very few people would ever benefit from this type of support unit, it is simply too firm to work properly for most people, and is akin to lying on a table rather than a mattress. Lastly, orthopedic mattresses often command a higher price point than say an entry level pocket sprung mattress. So in reality, you’re paying more for a much cruder mattress construction compared to pocket springs. The tag of orthopedic, if renamed to something more accurate, like ‘Firm low response cage sprung mattress‘ would not sell half as easily and would allow customers to avoid being tricked into thinking this is some sort of health mattress! Unless you’re on a really tight budget an open coil mattress should never be your go-to choice for mattress support. Given the development and accessibility of pocket springs now in the entry level mattress market, you should be able to avoid settling for one of these models. If your budget really is tight why not look at our Outlet stock where we sell our returned mattresses at a discount? We detail how we grade these mattresses here. A pocket spring mattress will last far longer and provide far better support than an open coil mattress ever can. If you need more help why not give our friendly team a call on 0161 437 4419.